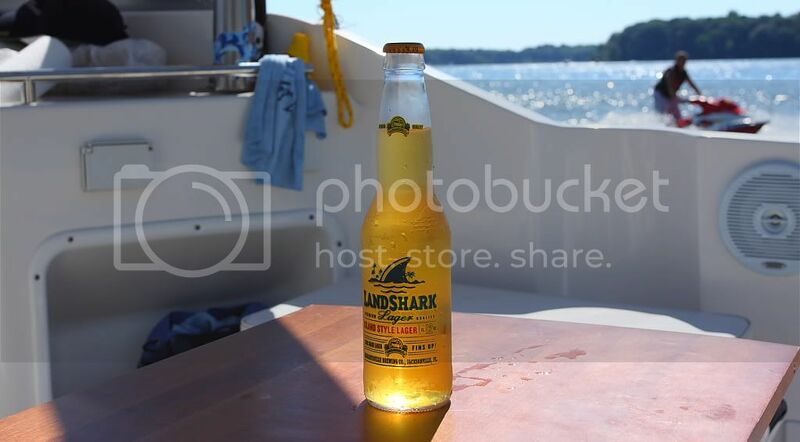 The beer of the month for July is Land Shark Lager. I got introduced to Land Shark by a co-worker of Beth's at a bbq a couple years back. Upon the first sip it was familiar, like I've known it for years...but apparently it was just launched in 2006 to promote Jimmy Buffet's Margaritaville restaurant chain (ba-dum-tish). JB sung a song called 'Fins' that was the inspiration for the name. At first glance you'll think Corona (which I consider a 1 star brew) while looking at the bottle, but this is a better pale lager in my opinion; but who doesn't know Corona's overrated. Land Shark is light, easy and quite refreshing, yet not watery and vague in flavor like light beers, which makes it a great summer beer. This is why it takes the summer month of July. I instinctively picked it out for a recent boating trip and I couldn't have been happier as the sun was present in abundance. 3 stars. Great pick! I love the picture too... pretty much an ideal summer day!